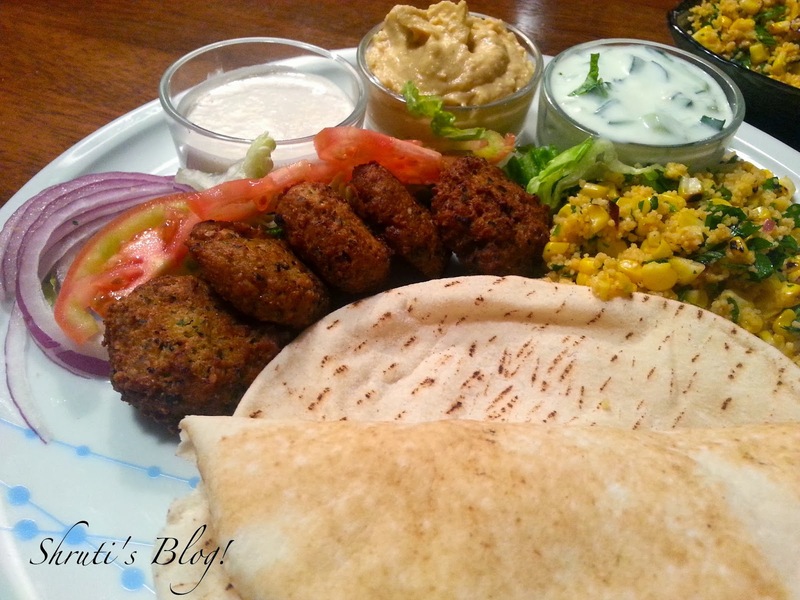 Shruti's Blog: Just Falafel? Just saying…! The Robomaid ad on Facebook had followed me like a balloon man follows little children in the park. I think they have sensed that I am giving in. My conspiracy theory is they are targeting anyone who has an interest in dogs and cats as pets and yearns for the mythical vacuum cleaner to the impossible. Due to my foodie pursuits, Facebook’s “interest targeting options” suspect I have an eating disorder, and am desperate to try out Acai Berry, African Mango, Garcinia Clusiaceae, lap-bands and even hypnotic lap-bands. Sigh. But I don't take offence. No, not even when Kevin Rudd’s populist, swan song attempts to woo his electorate saw a surge of Australian government ads popping on my timeline. My telltale Indian/overseas born status must have attracted those ominous warnings that asylum seekers boats will be turned back. The latest in these ad-attacks, is the “Just Falafel” ad, exhorting me to “Own my Just Falafel franchise in Melbourne” each time I log in. I must confess I have clicked on the ad and find the idea absolutely tempting! Love the concept of a vegetarian falafel, an icon of Arabic cuisine, customised to suit various ethnic flavours. I ask myself, do we have it in us to make our own renditions of masala wada, ambodey or daalwada falafels with some til chutney, chana dal dangar chutney, koshimbir salad and cucumber raita? All rolled up in a Lingayat jowar bhakri wrap or whole wheat phulka? Do I have it in me to pander to the “business bug” yet again and slog away the next few of my dwindling years? My Robomaid was delivered the other day. Does that mean this a portent for the falafel business? Surely, there must be some special providence in why I see this ad all the time. Perhaps the recent recognition our current education business has received makes me bold. Till I figure that out, let me tell you about the falafels my daughter Amruta made last weekend. 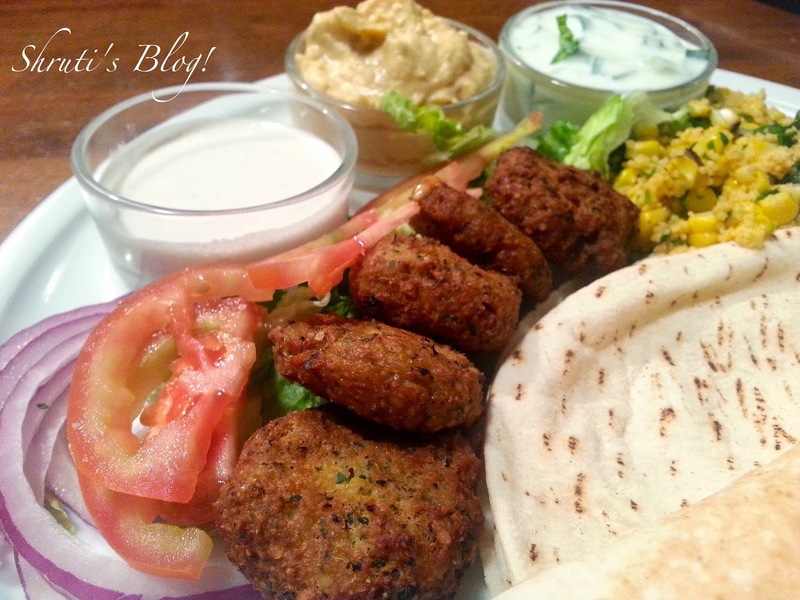 These are real authentic falafel – made with chickpeas as well as ful medames or fava beans. And the most delicious ones at that. Amruta served them with homemade hummus, homemade tahini sauce, salad, and falafels with some fresh pita. Drain and rinse the fava beans and chickpeas and put them in a food processor. Add the onion, parsley, coriander, garlic, baking powder, salt, cumin and spice powder. Add just a little water, if you must, and process until the mixture is into a coarse dough. Transfer the ground mixture into a bowl. In a wok or kadhai, heat oil. Shape the felafel mixture into small patty shapes and drop them into the hot oil and fry in small batches for about 2 minutes or until browned and crisp. The Arabs use a cute little contraption to make perfectly shaped falafels that can be ejected into hot oil. But you can make falafels by hand. Drain on kitchen paper and serve hot, with hummus, tahina, tzatziki, a side salad of shredded lettuce, sliced Lebanese cucumber, tomato and red onions. Falafels looks absolutely delicious and are very well plated. Kudos to Amruta! here from Facebook IFF. Love your writing. And who doesn't like falafels. I recently tried baking them - a real kitchen dud! Some things are best fried. I'm a huge mediterranean food fanatic, so the whole platter looks good. I've never made Tahini myself, pretty impressive work by Amruta! And thanks for your compliments to Amruta, I will pass it on to her!